Cheap and good food is hard to come by, so you’ll want to mark down this place for future visits. Kedai Makan Muhajirin has been in business for nearly 30 years now, and they have recently relocated to a coffee shop at Block 20 Toa Payoh Lorong 7. This stall is popular for affordable food, and their dishes sell out really fast. The hard-working owners start cooking at 4am every morning, to make sure that their store is ready for the morning crowd at 6am. Besides their popular Nasi Lemak (from S$1), they also offer their traditional Malay dishes such as Mee Rebus (S$2.50), Mee Soto (S$2.50), and more. Kedai Makan Muhajirin keep their prices low because they wanted to make it affordable for the older customers. Some days, you can see a queue forming from the front of the store, all the way to the end of the coffee shop. 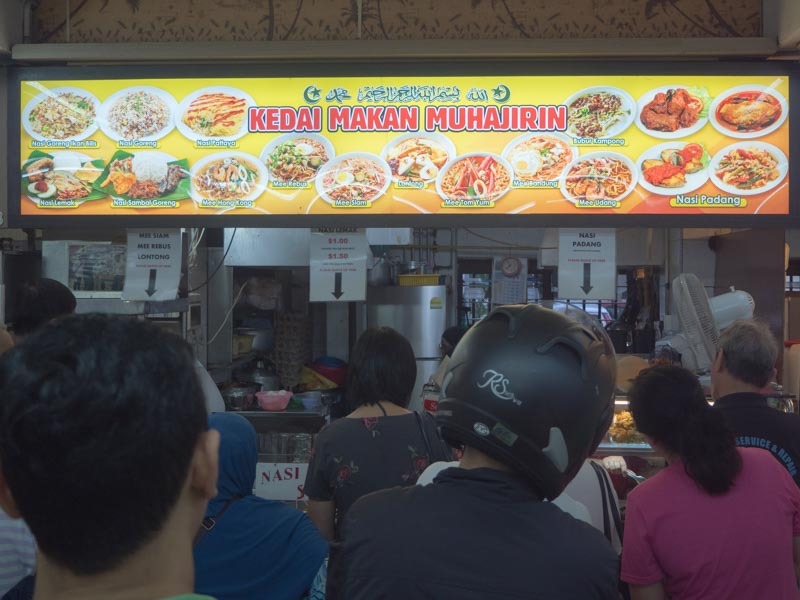 To keep the customers circulating, they had three separate queues: one for Mee Rebus and Mee Siam, one for Nasi Lemak, and one for Nasi Padang. 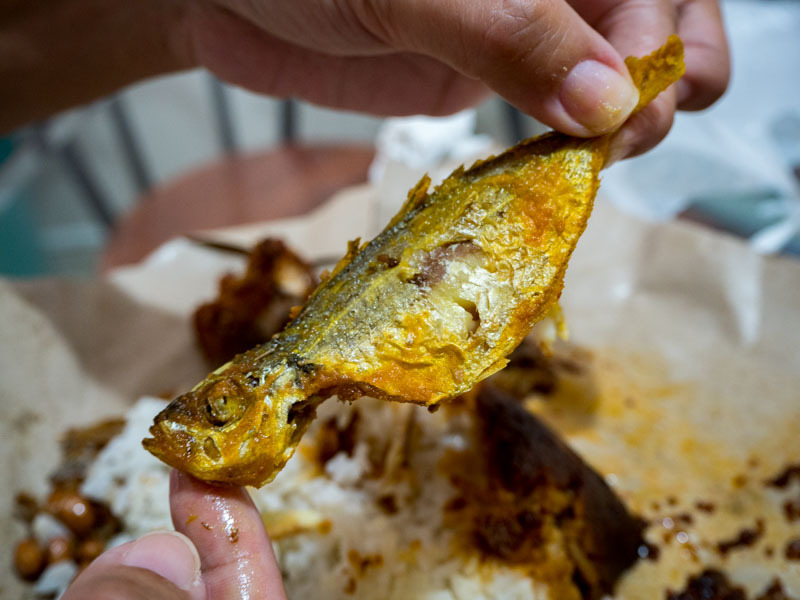 Their affordable Nasi Lemak (S$1) comes with a slice of fried egg, a side of sambal chilli, and a choice of either selar kuning (deep fried mackerel) or ikan billis (deep fried anchovies). If you want both ikan billis and selar kuning, it’s an additional S$0.50. 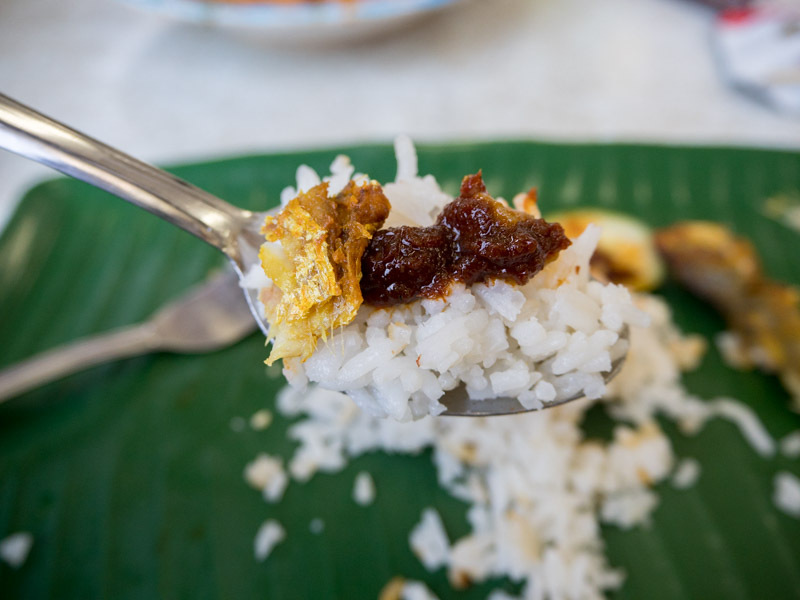 One of the main things to look out for in nasi lemak is the fragrance of their rice. The rice from Kedai Makan Muhajirin had just the right amount of coconut and pandan flavour. However, it was slightly overcooked, giving it a slimy and sticky texture which I didn’t like. 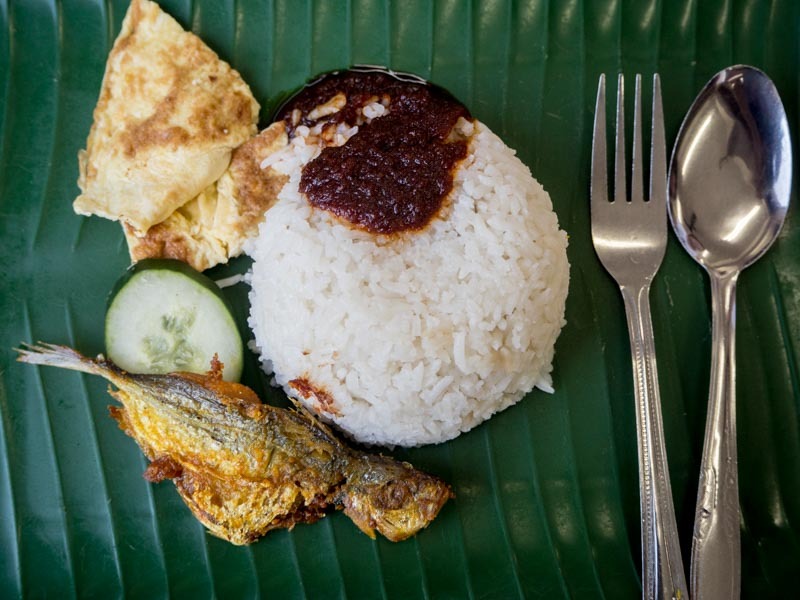 Another key element for a good plate of Nasi Lemak is the sambal chilli sauce. Their chilli wasn’t overly sweet or spicy, so I could still enjoy the fragrant rice without getting overwhelmed by spice. I chose the turmeric-coated selar kuning, which was a bit soggy because it was left there for a while. The briny fish went really well with the coconut and pandan fragrance of the nasi lemak rice. It was difficult to eat the fish because of the large number of bones, and it was easier to just peel the meat off its bones. They are very generous with their rice portions, and one pack was enough for me. In fact, I wanted to try their Nasi Lemak with Chicken Wings (S$3), but it was all sold out by 7.45am! I’ll definitely have to go back there earlier to try out their chicken wings next time. Since Kedai Makan Muhajirin also offers dishes other than nasi lemak, I decided to try their Mee Rebus as well. 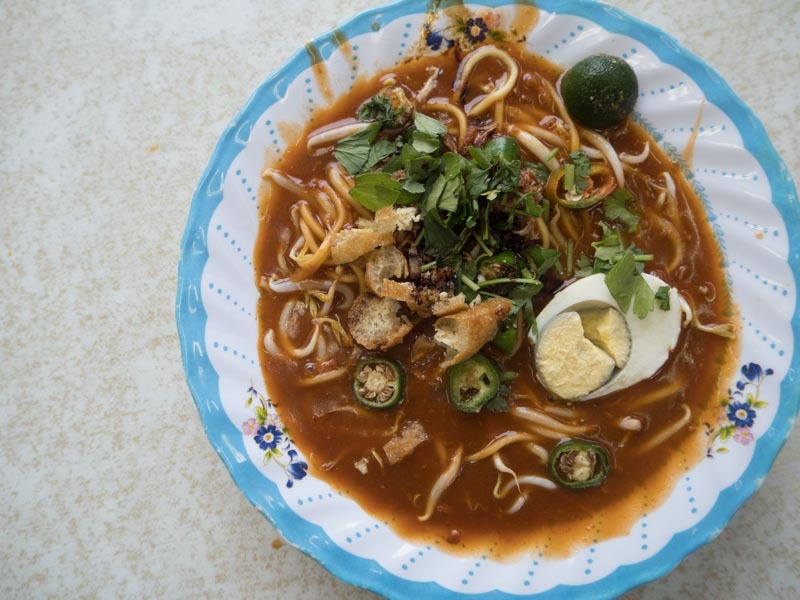 Like most other traditional mee rebus, the yellow noodles were soaked in a thick curry gravy. Along with the noodles, there were bean sprouts, and tau pok (beancurd skin). The tau pok was slightly tough, but when I bit into it, the curry gravy oozed out in my mouth. This dish was slightly disappointing as the sweetness of the curry gravy overpowered the spiciness. If you live nearby, head over to Kedai Makan Muhajirin for affordable Malay cuisine to satisfy your early morning cravings. Nevertheless, you can probably get a better plate of nasi lemak elsewhere for a slightly higher price.